This super simple Blueberry Slab Pie is the perfect dessert to feed a crowd. Grab a fork and lets dig in! Warm weather has finally arrived in Michigan and it feels like summer. Although it's not technically summer yet, Memorial Day is the kick off to the season in my house. Now starts the BBQ's, potlucks, pool parties and family reunions. Some of my favorite summer events. With those parties comes food, which means we're usually bringing a dish along with us when we visit family and friends. There are so many delicious dishes to bring, but of course I love to bring dessert. 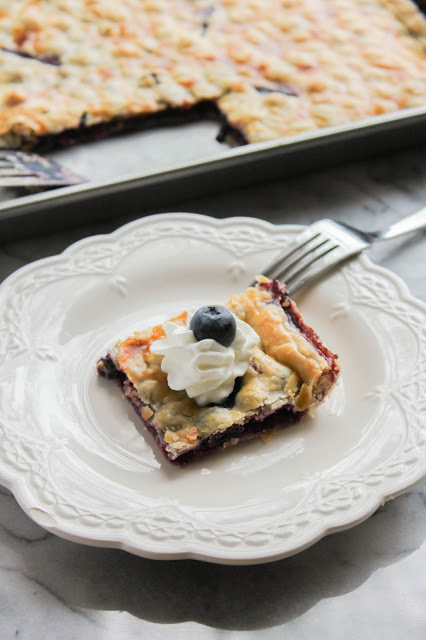 And this simple Blueberry Slab Pie is my new favorite. Slab pie is like a regular pie, but bigger. And better. And it's the perfect dessert to feed a crowd. I use store bought pie crust, but if you have a favorite homemade recipe then by all means use that instead. I love to bake, but I haven't perfected pie crust making yet. Shh, don't tell anyone. Preheat the oven to 375 degrees. Lightly spray a 9 x 13 inch rimmed baking sheet with non-stick cooking spray and set aside. In a large bowl, gently mix together the blueberries, 1/4 cup sugar, cornstarch, lemon zest and lemon juice. Roll out one of the pie crusts into a rectangle, about 10 x 14 inches in size. Place the crust into the prepared pan, then pour in the blueberry filling. 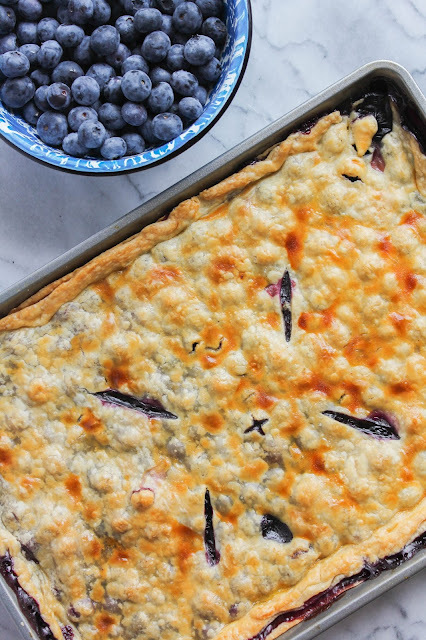 Roll the second pie crust into the same size and lay it over the blueberry filling. Press the two crusts together to seal and crimp the edges. Whisk together the egg and a teaspoon of water. Gently brush the egg mixture over the top of the pie with a pastry brush, then sprinkle with the remaining tablespoon of sugar. With a small, sharp knife, cut slits on the top to vent. Bake the pie until the crust is golden brown and the juices are bubbling, about 40 minutes. Let cool on a wire rack for about an hour. Serve warm or at room temperature. 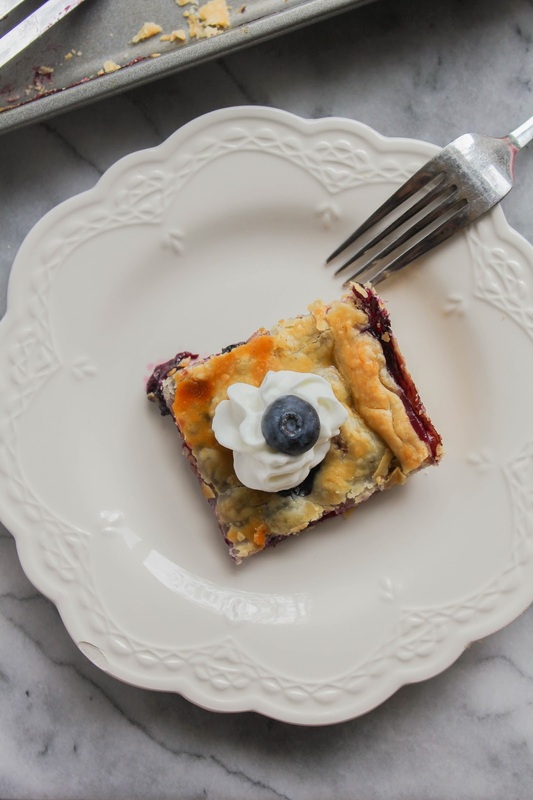 Top with whipped cream and additional blueberries, if desired. 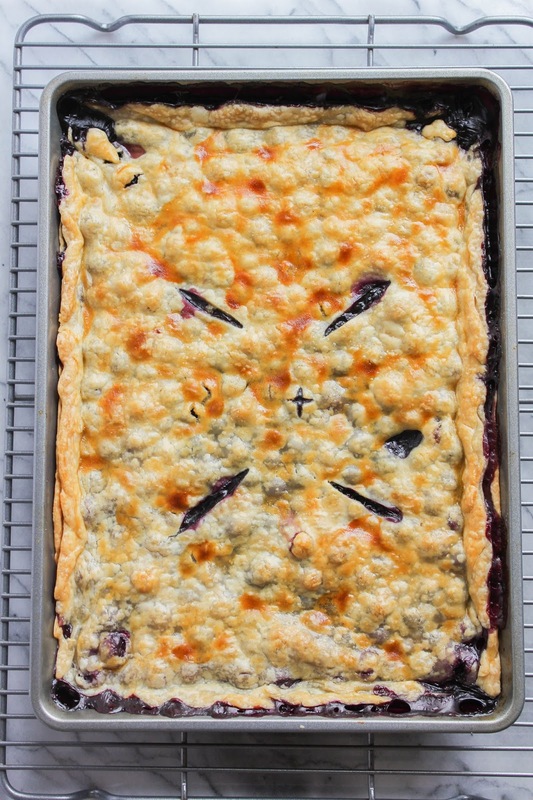 #SundaySupper Summers Best Potluck Dishes!